Starting next Thursday November 17 the Club will be opening on Thursday rather than Friday nights. All other details remain the same. Meanwhile last Friday the fourth on November in the final round of the Spring Swiss, Reza Daneshvar who was leading the tournament lost to Zoran Babic. Rod Hessing won his game against Mio Ristic to hold outright first place. However, Rod has proposed that he play a further match against Zoran to make up for a game Zoran forfeited to him earlier. So Rods’ result will be considered provisional for now. 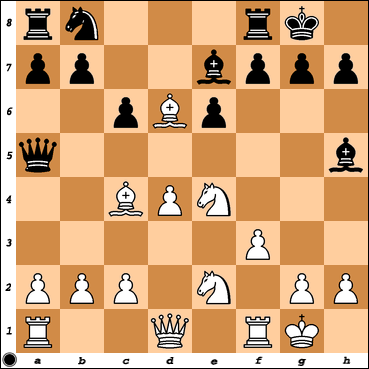 1.e4 d5 2.exd5 Qxd5 3.Nc3 Qa5 4.d4 Nf6 5.Bc4 Bg4 6.f3 Bh5 7.Ne2 e6 8.Bf4 c6 9.O-O Be7 10.Ne4 O-O 11.Bd6?? Meanwhile on board one Zoran Babic stopped Reza Daneshvars’ run at first place with this Centre Counter Defence.